In a hard-hitting and provocative polemic, Silicon Valley insider and pundit Andrew Keen exposes the grave consequences of today’s new participatory Web 2.0 and reveals how it threatens our values, economy, and ultimately the very innovation and creativity that forms the fabric of American achievement. Our most valued cultural institutions, Keen warns—our professional newspapers, magazines, music, and movies—are being overtaken by an avalanche of amateur, user-generated free content. Advertising revenue is being siphoned off by free classified ads on sites like Craigslist; television networks are under attack from free user-generated programming on YouTube and the like; file-sharing and digital piracy have devastated the multibillion-dollar music business and threaten to undermine our movie industry. Worse, Keen claims, our “cut-and-paste” online culture—in which intellectual property is freely swapped, downloaded, remashed, and aggregated—threatens over 200 years of copyright protection and intellectual property rights, robbing artists, authors, journalists, musicians, editors, and producers of the fruits of their creative labors. The very anonymity that the Web 2.0 offers calls into question the reliability of the information we receive and creates an environment in which sexual predators and identity thieves can roam free. While no Luddite—Keen pioneered several Internet startups himself—he urges us to consider the consequences of blindly supporting a culture that endorses plagiarism and piracy and that fundamentally weakens traditional media and creative institutions. 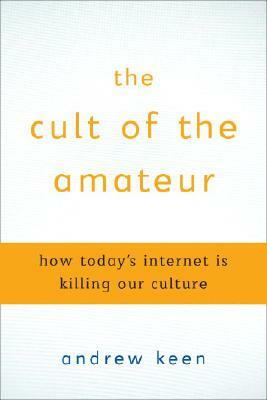 Offering concrete solutions on how we can rein in the free-wheeling, narcissistic atmosphere that pervades the Web, THE CULT OF THE AMATEUR is a wake-up call to each and every one of us. “Important . . . will spur some very constructive debate. This is a book that can produce positive changes to the current inertia of web 2.0.